The prompt for the August Break today is handwriting — and I was all set to go in that direction — until I spotted this beautiful face and exquisite face-painting at a puppet festival in town. I thought it was appropriate. Now for another treat. I just discovered the work of Elle Bruce, a Canadian photographer, through 500px. When I entered her site, I immediately knew this was someone whose photography I wanted to see more of. I have started to dip into her blog and am thoroughly enjoying her posts. Too many landscapes these days are way overdone in my opinion — contrived and over-processed. Elle’s are quiet and subtle, but they get under your skin. Have a look at her portfolio if you have a chance. You can also follow her on Facebook. Such a delicate face painting and soft capture. I love the pink and green together. Now I’ll check out the link you give above! 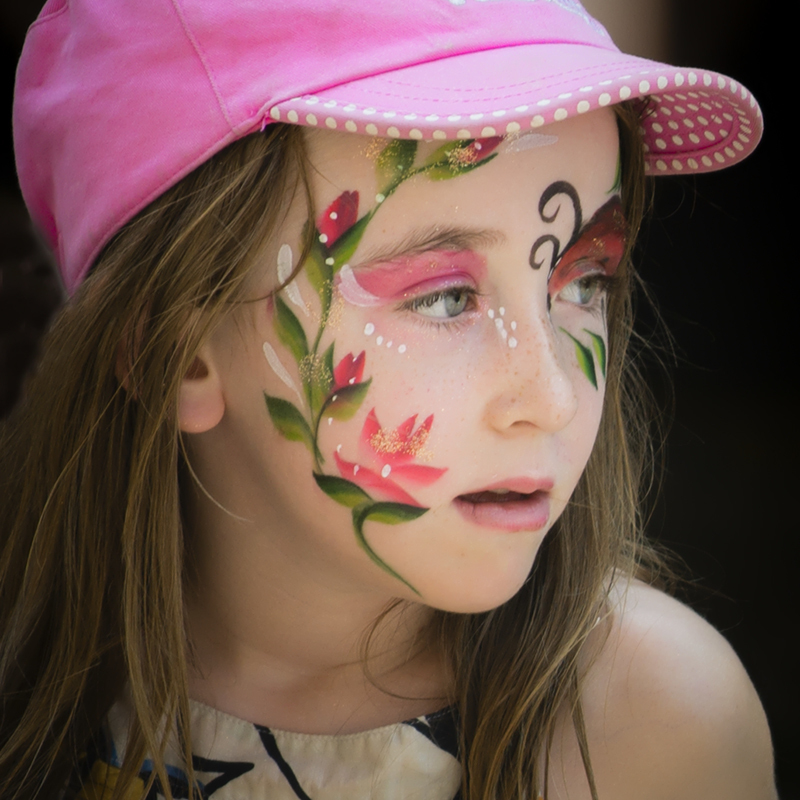 What a beauty she is and her face painting is truly a work of art. A very lovely capture of her, the light is so nice and soft. Thanks for the intro to Elle Bruce, her work is absolutely astounding! Beautiful portrait, and thanks for the tip on Elle – her work is wonderful! What a beautiful portrait this is, Sherry. I love the softness and the colors. I just visited Elle Bruce’s site. Simply magical! Isn’t she sweet? All color-coordinated and so cute. Going to check out that landscape site. Such a beautiful portrait, love the face painting one of the best I have ever seen. The landscape photography is one of the best I have ever seen.